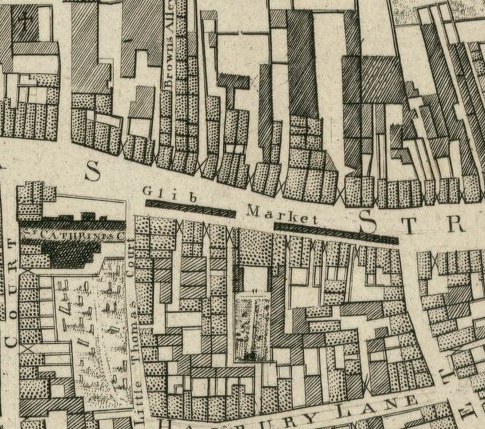 On Rocque’s map, 1756, there is a substantial curb-side marking on Thomas St with the label “Glib Market.” It lay just east of the entrance to St Catherine’s Church in the direction of Meath St. The name “Glib” comes from an ancient watercourse; the Glib River (Brooke-Tyrell, 1983). While it was originally thought that this was laid out in 1670, it was later found to be much earlier. A Trinity College deed from 1349 makes reference to Pype Lane, at the back of Thomas St and a 1426 deed mentions a lane “through which the water of the pipe of Dublin runs.” Whatever the origins, in 1696, an order was made to provide costs to cover and pave over the Glib, and in 1709, a proposal was mooted to establish a Hide Market at “the back of the Glib Water in Thomas Street.” (Jackson, 1950, who covers the Glib watercourse in glorious detail). The children are never to assemble together in the streets, either going to, or returning from school: never to join any riotous meetings, or to stand listening to ballad singers or swearers (from Brooke-Tyrell, 1983). Glib was also the source of a name of a bank on the street (Archiseek Forum). A will of 1747 left money to two clerks of the bank; Abraham Fuller and John Bell (£100 each – what loot!). The bank was located in what is now, or what was, Frawley’s Department Store. Val. Jackson (1950) The Glib Water and Colman’s Brook, Dublin Historical Record, 11(1), 17-28. 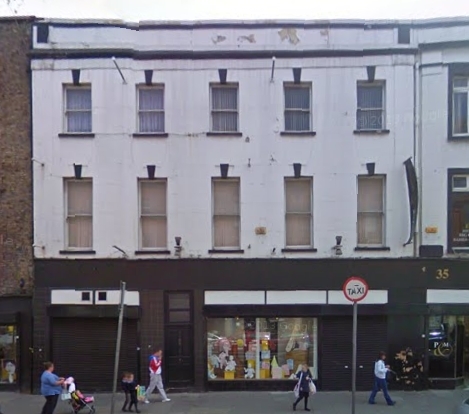 Alma Brooke-Tyrrell (1983), Focus on Thomas Street, Dublin Historical Record, 36(3), 107-117. Archiseek Forum on Glib bank at Thomas St.